A.I.!!! You're killing me here. You cut off the braids? The cornrows... gone? What! Is it no longer cool for ME to have cornrows now? And oh my word you totally just ruined Halloween when I was going to do a repeat of last year's Slutty Allen Iverson costume. Sad face. 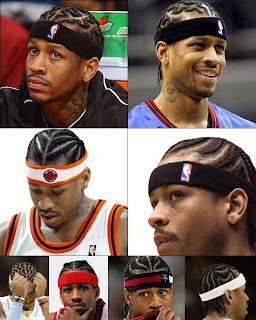 Thanks to my homie Nate Jones of FanHouse for keeping up the NBA Hair Watch in my absence. Cornrows image via Cool Mens' Hair, one of my favorite daily reads. P.S. Is Iverson giving us the finger in this Getty picture?